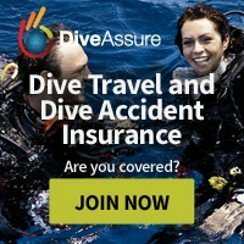 The primary domain of divers is the coral reef, since most diving around the world takes place on coral reefs in the tropics. As divers we swim around reefs marveling at all the weird and wonderful creatures that surround us. While it is relatively easy to identify the fish we see around us, identification becomes a little bit trickier when faced with the enormous variety of tiny critters we see. However, when it comes to corals most of us are not very good at identifying them. These stalwarts of the ocean just hang in the background resolute in their presence, providing a home for almost all the marvelous critters that enthrall us. 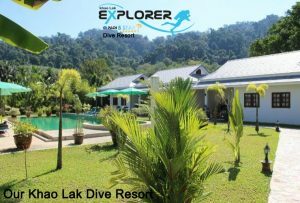 Scratch the surface of corals and what you discover is a magically diverse and wonderful world as complex as any other. All the different types of corals below can be found at the Similan islands. 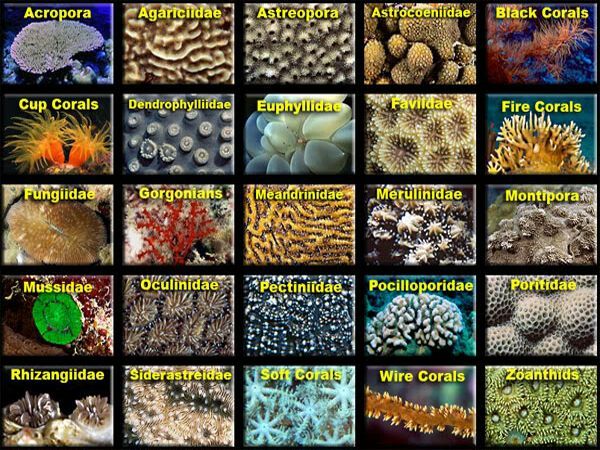 So before we have a look at all the different types of coral, the first question is what on earth is coral? Somewhat like the classic song “is it a plant, is it a fish, is it a rock? No it’s an animal!” Yes, coral, which seems to resemble a rock or a plant is actually an animal. 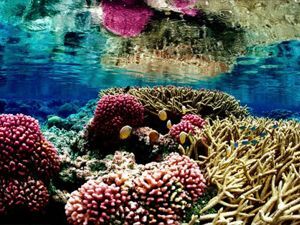 In fact, coral reefs are formed by a symbiosis between corals and algae (zooxanthellae) that live inside their tissues and provide the animals with by-products of photosynthesis (food), and their wonderful colors. 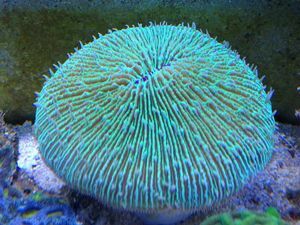 As you probably have experienced, corals come in an absolutely amazing mix of colors, shapes and sizes. Coral colors range from green, brown, pink, yellow, red, purple or blue; the exact color will depend on the exact mix of the zooxanthellae algae present within their tissues, some corals are even known to be fluorescent; these amazing color patterns are due to the incredible concentrations of algae in the coral, with several million algae present per square centimeter of coral. 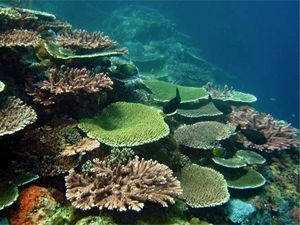 Massive corals: these are the mainstay of most reef and are boulder shaped. 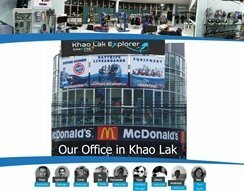 This category varies in size from the size of a normal egg, to and enormous two story house. 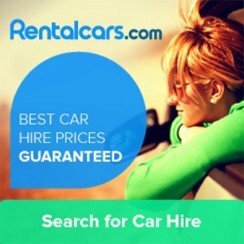 They are very slow growing with growth rates of 0.5 to 4.5 cm per year. 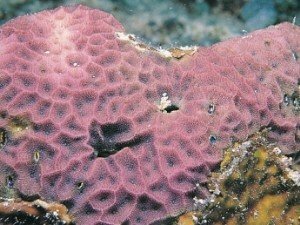 Foliose corals: these are again among some of the most recognizable corals and are characterized by broad plate-like flaps that stick out from the underlying coral substrate. Common types of these are salad corals and leaf corals. Most of these are referred to by these names since the resemble a giant lettuce head or other leafy structures. Table coral: again one of the most easily recognisable corals, characterised by a rising trunk and multiple fused branches that spread horizontally to create a table-like structure. These corals are one of the most commonly associated with coral bleaching and the el Niño effect. Encrusting corals: these are some of the fastest establishing corals and are commonly seen by divers on shipwrecks and on newly sunken artificial reefs. These corals get their name from the fact that they form a crust on a substrate, and spread across the surface creating a thin colorful surface. Elkhorn corals: as the name suggests, these types of corals resemble the branched horns of elk or deer. They tend to protrude vertically with many several off shooting side branches. 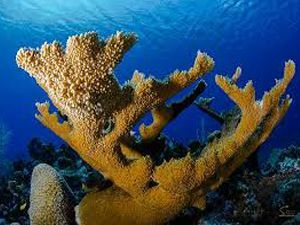 The most common of these is the staghorn coral. Digitate corals: this category of corals resembles fingers or large clumps of cigars, that have no other branches. 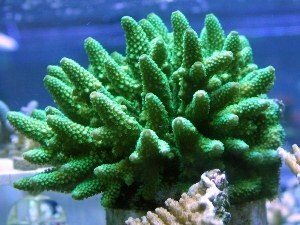 They grow vertically and are generally not as common as most other types of corals. Mushroom corals: as their name would suggest, these resemble the cup of a mushroom. Mushroom corals are solitary corals made up on a sole polyp than can reach up to 25 cm diameter. They generally lay on the ground, unattached. Again they are not one of the most common corals around. 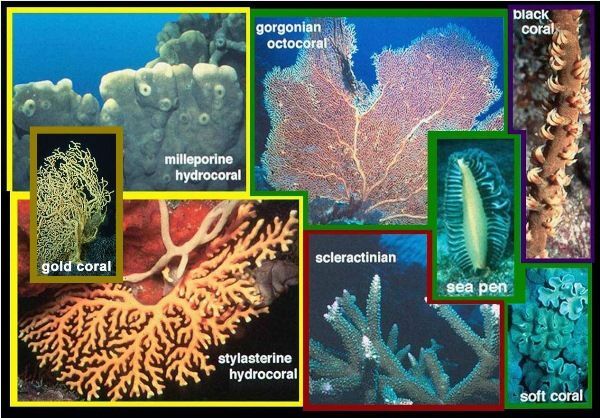 Branching corals: this type is most commonly associated with the most colorful small corals, and are made up of a tree-like structure with multiple branches and secondary branches. As with most creatures on the planet there is a great degree of variance in corals, depending on several environmental factors and the actual geographic location of the coral; the Red Sea being different to the Indo-pacific, and both being different to the Caribbean. Finally, there is some variance caused by linked genetics among the local coral population. So what type of coral is the dreaded fire coral? Well, this is probably the most ironic of aquatic situations, since probably the most well-known of all corals is not a coral at all. Although they look like a number of types of hard corals in reality the feared and much maligned fire coral is a Hydroid. Hydroids are a family of stinging invertebrates within the cnidarian and include amongst others jellyfish. 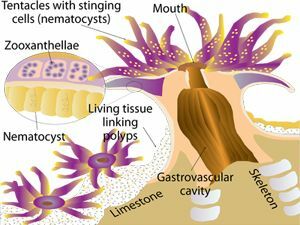 Thus in the bizarre world of marine biology, fire corals have more in common with a jellyfish than with any other real life coral. 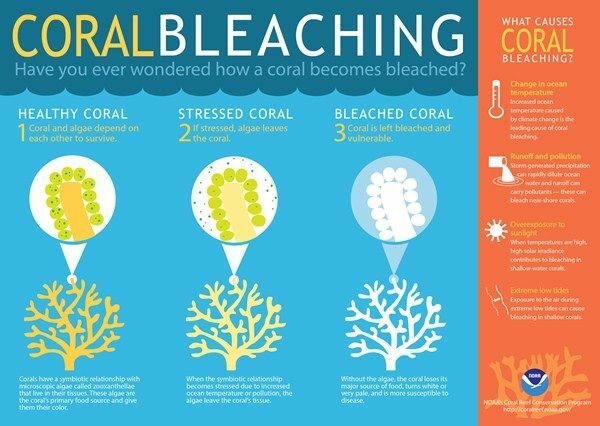 So why do we see white corals and what is coral bleaching? Coral bleaching is so called because the normally colorful colors look like they have been bleached away, leaving a white coral. This is caused by the loss of their internal symbiotic algae; these algae are highly sensitive to many environmental factors and once they leave the coral, all that is left is the limestone skeleton of the coral, which is a white colour. So how does El-Nino affect corals? Basically, the El-Nino event occurs when there is an elevation in the water temperature. 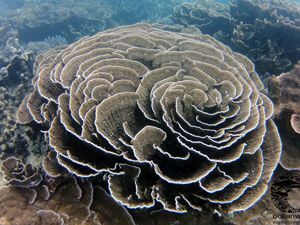 While we do not fully understand the cause of an El-Nino, its ramifications can be immense and very destructive for coral reefs. 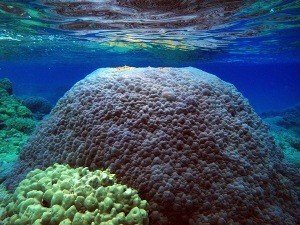 Due to the incredible sensitivity of the algae within corals, an unusual spike in the temperature by only one or two degrees can lead to the algae’s departure, which in turn often results in the death of the entire coral and reef, unable to sustain its growth and being smothered by bigger algae. 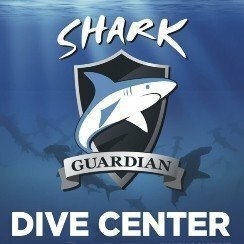 Do corals have any predators? 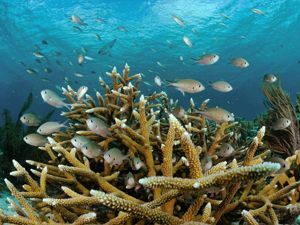 Several actually, there are some predators that are part of the normal life-cycle of a coral reef such as turtles and parrotfish, who will munch on large chunks of coral as part of their daily routine. These predators do not attack the reef in an unsustainable way and there is a delicate balance that is maintained. On the other hand, there is one predator that can devastate a reef and that is the crown of thorns starfish. 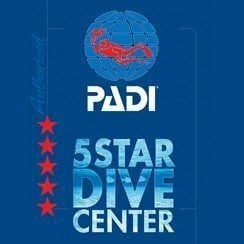 When outbreaks of this starfish occur on reefs, destruction gets out of control and reach pandemic proportions and completely destroy the reef in the space of a few months. 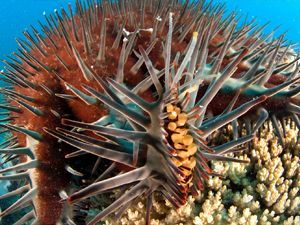 One of the theories behind these outbreaks is that man has removed the giant triton shell from reefs, which is the natural predator of crown of thorns starfish.